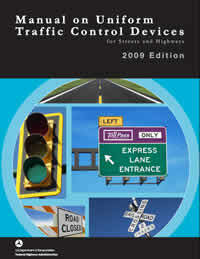 As the recently appointed voting member of the National Committee on Uniform Traffic Control Devices (NCUTCD), I thought it might be helpful to do a few blog posts about what goes into the Manual of Uniform Traffic Control Devices (MUTCD). If you're unfamilar with the MUTCD, it defines the standards used by road managers nationwide to install and maintain traffic control devices on all public streets, highways, bikeways, and private roads open to public traffic. The MUTCD is published by the Federal Highway Administration (FHWA) under 23 Code of Federal Regulations (CFR), Part 655, Subpart F.
The MUTCD, which has been administered by the FHWA since 1971, is a compilation of national standards for all traffic control devices, including road markings, highway signs, and traffic signals. It is updated periodically to accommodate the nation's changing transportation needs and address new safety technologies, traffic control tools and traffic management techniques. The MUTCD has a rich history of engineers sitting around the table at conference hotels determining when and how to install traffic control devices. The history of transportation research dates back almost 100 years and is well documented by FHWA here and also on Gene Hawkins' website. Gene Hawkins is perhaps the most knowledgeable person on the subject having written several articles for the ITE Journal. On his website introducing the history of the MUTCD, he highlights the changes that have occurred over time by describing that in 1948, "Stop signs were yellow, highway centerlines could be white, and green guide signs did not exist." Uniformity is a key focus of the endeavors of the National Committee as described in this July 1992 ITE Journal article. It is deemed important in the research engineers undertake. It is mentioned in the concluding summary in the article: "despite the pioneering efforts of the AASHO (organization now known as AASHTO) and the National Conference on Street and Highway Safety, much more remained to be accomplished. For instance, the presence of two separate manuals, one form urban conditions and one for rural conditions, created conflicts that could not be easily resolved." Rural is for roads greater than 40 mph and urban is 40 mph and less. As a practitioner that deals with multimodal travel, that definition left me wanting more specific information regarding where that came from. In Portland, more than 95% of our streets are 35 MPH or less. Regardless of your hometown's conditions, several questions came to mind that might be of interest to APBP members. What about the suburban conditions? What about a rural condition that is less than 45 MPH? How does this translate to downtown conditions? Are you saying you'd treat a 25 MPH street the same as a 40 MPH road? There are a lot questions and only in exploring the MUTCD a bit more lead me to discover additional information on the definitions of rural and urban. The Manual defines "rural" and "urban" as the following: Rural Highway—a type of roadway normally characterized by lower volumes, higher speeds, fewer turning conflicts, and less conflict with pedestrians. Urban Street—a type of street normally characterized by relatively low speeds, wide ranges of traffic volumes, narrower lanes, frequent intersections and driveways, significant pedestrian traffic, and more businesses and houses. The speed distinction is used throughout the Manual with one additional addition. In the traffic signal warrants portion, there is also the condition that allows an "isolated community having a population of less than 10,000" to use a lower volume threshold like a rural condition even if it is lower speeds. The question that remains is this: Does striving for uniformity represent the problem with the existing Manual? Are all urban conditions the same within the range of speeds from 20 MPH to 40 MPH? Is it an adequate expectation that it should be applied equally in the suburban conditions as it is in a downtown setting?